The only bike shop in all of Juneau, Glacier Cycles, shuttered its doors on Christmas Eve. Before I left town for my Christmas trip to Whitehorse, I stopped in one last time to clean them out of all of their lube and 29” tubes, and say goodbye to the great guys at my soon-to-be-former LBS. I felt a mixture of guilt — for all of the bike parts and gear I had purchased on the Internet — and low-level panic, because without access to a commercial bike mechanic in town, mechanically incompetent cyclists such as myself are pretty much screwed. I knew the time would come, sooner or later, when one of my bikes would be rendered inoperable by a mechanical I could not fix. I was hoping that time would come later rather than sooner, but sure enough, yesterday I discovered a broken spoke in the rear wheel of my mountain bike (on the cassette side.) In addition to this broken spoke are several loose spokes, and a severe wobble that tells me this wheel is not far from total collapse. I’m a bit frustrated with my options. I can’t replace the spoke because I don’t have a tool to remove the cassette, and even if I did, the wheel is so out of true that I shouldn’t ride it anyway. I could go online and buy a new wheel, which is probably what I will do. But how do I install a new cassette? Is this something I’m going to have to figure out how to do myself? Am I going to have to buy tools? I am not happy. Not happy at all. In the meantime, I can’t ride my mountain bike. I don’t like to ride Pugsley on wet roads — the result is not unlike taking a shower in a fountain of grit. Which leaves me with my road bike. I never ride my road bike in the winter. Juneau’s heavy precipitation and continuous freeze-thaw cycle guarantee a constant mess of ice, slush, gravel and mud all over the pavement. A bike with skinny tires and no studs - though considerably faster - just isn’t worth the risk. But today I wavered on my “No Road Bike In The Winter” rule. Although it still drops below freezing at night, we’re at the tail end of nearly a week of temperatures in the 30s and rain. I thought maybe, just maybe, the rain had scoured enough of the slush to make skinny tires viable. For a couple miles, I felt almost unbelievably light and fast, like I was riding on a cushion of air. But then I came to the end of Fritz Cove Road and the beginning of the slush and gravel surface of the highway shoulder. I cut a narrow groove at least an inch deep, but the tires seemed to hold decent traction beneath the goo, so I continued. Farther out the road, conditions deteriorated. The slush became deeper, and soon it was coated in a thin veneer of crunchy ice. As I was coasting down the long hill toward the Shrine of St. Therese, I inadvertently rolled onto a solid layer of wet pack ice. When I realized this, my heart jumped into my throat. I knew braking would be suicide — pressing the brake pads against the rims all but guaranteed the wheels would slip out. So I did the only rational thing I could do: I screamed. Then I death-gripped the handlebars and straight-lined it all the way down the hill. Eeeeeeeee! By providence or sheer luck, enough gravel was embedded in the hard ice to keep my tires upright. As soon as I reached a more level section of road, gravity generously slowed my death plunge and I was able to veer into a narrow track scraped bare by traffic. Scary! It was perhaps the scariest thing I have done on a bicycle all winter — certainly more frightening than any of my Pugsley ridge descents so far. Then, on the way home, I got a flat tire after running over a particularly sharp chunk of road salt. I only had a patch kit with me; my hands went completely numb while I waited for the glue to dry at glacial pace in the cold air. I began to rethink my rethinking of the "No Road Bike In The Winter" rule. Which means I'm down to one bike. I miss you, Glacier Cycles. ...and then get stuck in. fixing bikes isn't the black magic some people make it out to be. patience, logic and a glass of red wine are key. * Good on you for going out on the road bike, sounds like it wasn't too bad except for the flat. Keep it up but carry a tube (not just patches) and you're in business. * I bet you could craft some kent-from-seattle-style coroplast fenders for the Pugsley? * Are the wheels swappable between the Monkey and your road bike? That could help you get by. * In the long term you are probably better off investing in a truing stand and becoming your own wheelbuilder. In the short term it is tempting to just buy a replacement wheel. In the middle maybe you could buy a second wheelset and then have this one fixed up? * Swapping the cassette isn't hard if you have the tools. Go for it! I have to agree with all of the comments so far; overall an investment in tools, a book (Lennard Zinn comes to mind), skill and knowledge is worthwhile and will be with you for a lifetime. I live in a small semi-remote community with no bike shops within 200 km so driving 2-3 hours to buy parts that may have to be ordered in anyways is generally not worthwhile. My husband and I have built our own bikeshop in our basement aquiring tools, spare parts and stands over the past 5 years to become more empowered to fix and maintain our bikes. And yes there have been many online purchases for parts and accessories. I myself will learn to true the rear wheel of my mountain bike this winter now that we finally own a truing stand. Enact what Jenn recommended plus invite a friend over to share the wine. There's got to be somebody in your local area with the tools and know-how to remove a cassette. It's really not hard. Maybe you can offer someone a six pack in exchange for the service. Plus if he'll let you watch, you can probably do it yourself next time. Losing your local shop is a bummer. Good business and good people. Online buying guilt is tough; you want to support the local shop all the time but sometimes online shopping is just too easy and economical, and ebay is dreadfully nice for bike gear as well! I always try to buy something, even just a tube, when I visit my LBS, but one person cannot support a whole shop. Lots of good bike fixing advice already. You can do it. We should all learn from your experience. Most of us share your guilt...LBS's are valuable to have around! Surely the folks who wrenched at the shop haven't left Juneau. Perhaps they're working out of their garage(s)? I'd make a few phone calls before I gave up entirely! One spoke isn't a problem. I'm 235#'s and have raced mountainbikes missing a spoke. Just tighten up the existing loose spokes with a spoke wrench. If you don't have one you can use a crecent wrench, but this may be bad for future tightening. Once your spokes are tightened, you wheel will be close to true and probably rideable. If not, continue to play around tightening the spokes. Tightening some and loosening others until you have a decently true wheel. This will work until you can order a cassette tool and new spoke or small trueing stand. I feel your pain. Not only are you out of commission when something happens but you have to wait for parts to be shipped online. Then pay hazmat if you want certain lubes or grease... I prefer a couple of real beater-bikes with interchangeable parts. You may not even need to remove the cassette. I think the best advice for you is... find a friend. Most cyclist have a cassette tool and chain wip. Getting a spoke of the right length is a different story. Road wheels have a 130 rear spacing and Karate M. has a 135 so the road wheel will most likely not work. We're going to see more this if people don't wise up and support local businesses. I urge you (and everyone else who lives in a small town) to read Heather Lende's blog. 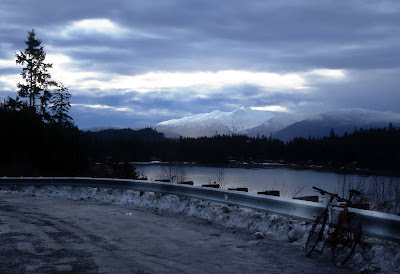 She is a writer/runner/cyclist in Haines who has a good sense of what it means to buy locally. She is not only a good writer, she has a deep sense of community as well as a lifetime of outdoor adventure. I second the notion of buying a decent stand and some basic specialized tools, and learning to wrench your own bike-it is fun to do, and is especially valuable given the fact that you no longer have an LBS. I was scared to touch most parts on my bike a year ago, and now I'm disassembling and reassembling shifters and derailleurs. Also, I cannot believe that you haven't joined the forums at MTBR.com. Go log on there and say that you're Jill from Juneau, and all the meatheads there will be falling all over themselves to help you (probably me included). I would bet that you know several of the people there already (esp. 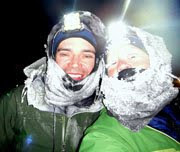 in the Alaska forum), and you'll likely run across some new local cycling buddies as well. I highly recommend the Leonard Zinn books if you choose to go the DIY route. I've been using them for years now, and I find them to be a great resource. Clear, concise, comprehensive, etc. It really isn't that hard to do your own work. I'm not even that "handy", and I've been able to figure out most of the basics. Good luck. dan has gotten good with wheels. he and i can fix this for you within a day or two. just gotta ask. You can do the repairs yourself! I know you can (and must) do it! In college I made a deal with a guy to change oil in my car in exchange for a batch of chocolate chip cookies. It worked out great for both of us. I say you find someone who enjoys working on bikes and is good at bike repair work and make an exchange of some sort. You can always learn to do the repairs yourself of course if you want to. If you are like me, I just want it done. I know, I know, I need to learn to fix my bike. I get it. That said, this post was just about complaining. Of course I know I have options for people to help me in town if I look. I am bummed the bike shop closed down, but I alone couldn't keep them in business. Their selection was very limited and there just aren't that many cyclists in town. It's sad a town of 30,000 can't support an LBS, but it seems we can't. I also wanted to add that I would really rather not ride a bike that I've fixed myself, fearing for my own safety. I feel this way even when I install my own brake pads. I just don't trust my own shoddy work, even with outside instruction. An example of this is my front brake calliper, which broke shortly before I started the Tour Divide. With help from my ex-boyfriend via telephone, I was able to jam the broken piece back in place. I didn't have time to get the work checked over before the race. But a big crash I had outside Steamboat Springs is directly related to this repair. I maintain that some people are just not natually inclined and therefore severly disadvantaged when it comes to mechanical understanding. Yes, you can teach a non-artist how to draw, but you have to assume it's going to be a laborious process with ultimately disappointing results. I sense a streak of stubbornness - ? Can't take the time to learn to fix a bike? Good lord, girl, all you have is time for yourself. I know people with demanding f/t jobs, families, other pursuits and they take the time to learn new things. You are way too young to be so set in your ways. Loosen up! Give her a break folks.... I can fix bikes and build wheels and everything, but can't write or tell stories about my adventures very well at all, when I do it is forced or not very interesting. That's why I bought her book - she can put endurance into much better words and emotions than I could ever express. P.S. You complained very eloquently. Sounds like quite the pinch. OK, maybe there's a small chance I could learn the fairly simple mechanics of a bicycle. But the process so far has been so frustrating for me that I'm fairly certain if I were given the ultimatum: "Learn to fix everything on a bicycle or never ride a bicycle again," I would buy a good pair of running shoes and never look back. As others have said, it is not very complicated to mount a cassette on a wheel. Check out the Park Tools site for a step by step guide as well as a list of all the tools you need. And you can always ask us questions! I would second WPG: The Zinn books are great. I am not particularly handy, but I have learned to do a lot of maintenance and repair myself. I am slow, but it is actually fun. The guys mean well...they don't understand the difference between "complaining to get it out of your system" and "soliciting advice on how to be a different person". In the case of Glacier Cycles, love 'em though I did, they were impossible to use as a retail shop. I'm all about convenience over savings; I bought all of my mountain trekking gear at local gear shop Foggy Mountain even though I could have got it for half the price or less online. But Glacier never had what I needed. I went in there once to buy a new helmet - A HELMET! - and they were fresh out. Also didn't really stock much in the way of parts. Everything had to be special ordered and their repair turnover time was downright glacial (ha ha ha.) It still beat the alternative, which is nothing.